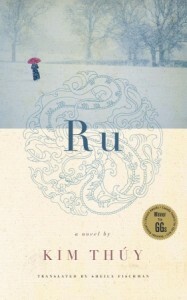 Ru is Kim Thúy’s time-shifting biographical novel about fleeing war-torn Vietnam in 1979 to start over in Granby, Québec. While labels are reductive, names and nouns are a linguistic starting point we rely on to understand what it is we’re working with. As a reader, I struggled with the book as a biographical novel. Which parts are true? Which bits are fiction? The fact that the line blurs, troubled me. I visited Hanoi, Vietnam for a short week, but of all my travels, it’s been my favorite trip. I guess — and my inability to digest this book as a biographical novel is not a criticism, simply my personal response — I’m eager to know more about a country I loved and want to return to from someone with first-hand experience far deeper than mine. Even memoirs have hazy edges; memory is malleable, imperfect, and fallible, though a fictionalized biography seems to taunt you with the truth. This book is a series of short, detailed, vivid vignettes — scenes set before you like a delicious, carefully prepared full-course meal, but you’re left wondering if the crab cakes you’re eating are actually made of pollock, or something else entirely. In French, ru means a small stream and, figuratively, a flow, a discharge — of tears, of blood, of money. In Vietnamese, ru means a lullaby, to lull. For me, “Ru” rings true in French as a river of tears, of blood, and money flows from re-education camps into Mirabel Airport in France as refugees flee Vietnam with all their worldly wealth (diamonds and gems) embedded in their teeth. I found dissonance in “ru” in Vietnamese as a lullaby, given the torture, expropriation, poverty, and depravity the book depicts. These questions aside, Ru is a beautiful novel translated from French into English. It’s featured as one of the books in the 2015 Canada Reads competition. It’s worth your time.